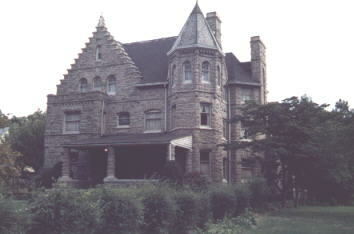 There is a castle in Williamsport called the Emery House, built in 1889 for Richard Emery. The architect was Eber Culver of Williamsport, formerly of Ithaca, NY. Culver designed many local homes and public buildings in a variety of styles. The Emery residence was designed in a modified Romanesque syle. Notable features include a pagoda style fireplace in the entry, and a crenellated room off the far side of the house (not visible in the photo).